Major publishers all have different strategies for selling ebooks to the public library system. Baker & Taylor, Overdrive and a myriad of others have to have enough of a selection to keep their patrons satisfied, but it can be challenging to know all of the different prices, terms and models that publishers employ, since they have changed many times over the years. Good e-Reader is proud to give you the 2018 edition of what publishers charge libraries for ebooks. Hachette Book Group is owned by Hachette Livre, which is a wholly-owned subsidiary of Lagardère. The company has numerous publishing groups but most of the ebooks and digital audiobooks produced by Hachette Digital are based primarily on books published by Grand Central Publishing, Little, Brown & Company, Orbit, Yen Press, Little Brown For Young Readers, FaithWords, and Center Street. Hachette simultaneously releases the ebook with the print edition each title that libraries purchase can be loaned out an unlimited number of times, under a one copy, one use system. The initial price that libraries pay is three times the primary physical book price. One year after publication, the purchase price will drop to one and a half times the primary book price. HarperCollins is owned by Rupert Murdoch’s News Corporation. The publisher implemented a 26 loan system in 2011 and once an ebook has been loaned out 26 times, libraries must repurchase the title. The cost of the ebook is the exact same as the hardcover print edition, so libraries are not paying extra, like they are with Hachette. Macmillan is owned by Verlagsgruppe Georg von Holtzbrinck, of Stuttgart, Germany. American imprints include Farrar Straus and Giroux, Henry Holt & Company, W.H. Freeman and Worth Publishers, Palgrave Macmillan, Bedford/St. Martin’s, Picador, Roaring Brook Press, St. Martin’s Press, Tor Books, Macmillan Higher Education and a myriad of others. 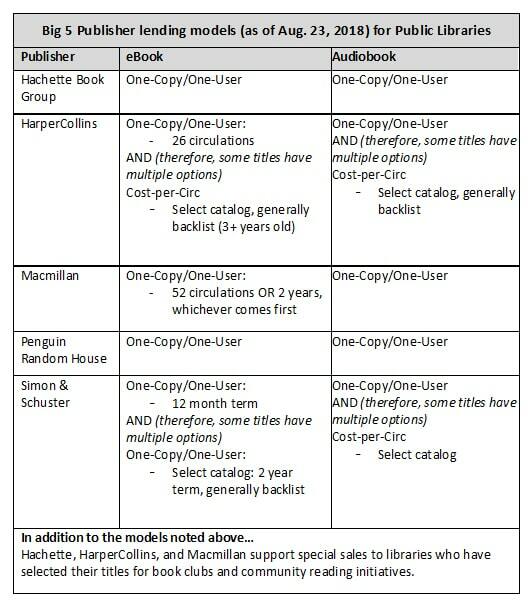 Macmillan backlist titles are available in the one copy/one user lending model for two years or 52 checkouts. Library pay on average $25 per title. Macmillian does not make available most of their frontlist titles to libraries for fear it will cannibalize their sales. TOR used to make their all of the front-list titles available, but recently scaled back after sales started to decrease. Some Macmillan imprints do release all of the front-list ebooks to libraries, such as ebooks from their Children’s Publishing imprint. Penguin Random House makes up for 1/4 of all books published in the entire world. Their imprints include Viking, G. P. Putnam’s Sons, The Penguin Press, Riverhead Books, Dutton, Penguin Books, Berkley Books, Gotham Books, Portfolio, New American Library, Plume, Tarcher, Philomel, Grosset & Dunlap, Puffin, Alfred A. Knopf, Ballantine, Bantam, Dell, Pantheon, Doubleday and a myriad of others. PRH has perpetual licensing, which means libraries only have to buy the digital title once and own it forever. Each ebook can only be loaned out to one customer at a time. The average ebook ranges in cost from $20 for a backlist to a ceiling of $65 per title. Simon and Schuster is a division of CBS Corporation. Imprints include Simon & Schuster, Atria, Free Press, Gallery Books, Pocket Books, and Scribner. The children’s division includes Aladdin Paperbacks, Atheneum Books for Young Readers, Little Simon, Margaret K. McElderry Books, Simon & Schuster Books for Young Readers, Simon Pulse, Simon Spotlight and a bunch of others. S&S has different terms for their frontlist and backlist ebook titles. A frontlist title has a 12 month term before it has to be repurchased and adhere to the one copy, one user system. Each book can be loaned out an unlimited number of times during this period. Popular trade titles appear to be mainly in the $20-$30 range, with lower prices for romance. Backlist titles range in price, but don’t really sell for more than a paperback. Backlist books also can be kept in the system for two years, before they have to be repurchased.